Contributed by: Alex Johnson (compuwiz@acm.org). 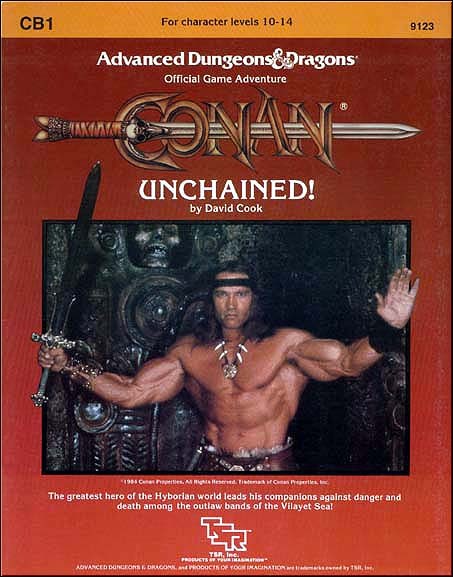 This is a 3E conversion of the 1st Edition "CB1: Conan Unchained" adventure by TSR, Inc. 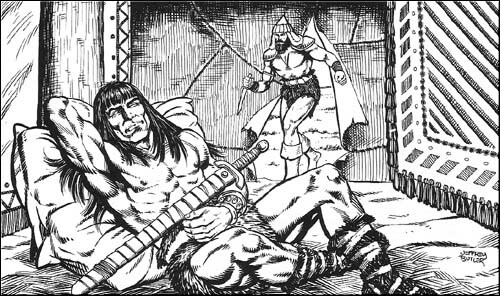 Note that the conversion is intended for Alex's own Hyborian rules and may not be balanced for the other Conan 3E versions. You will need the original module to make use of this conversion; it is still available from used-book sellers and online stores. 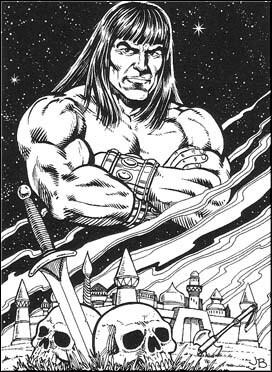 "In an age long ago, there existed a hero - Conan. With fiery will, he slashed his name across the ancient lands of Hyboria. It was a time when bravery, trickery, and magic decided men's fates, and a steel sword could make the difference between life and death. For the daring, strong, and clever, there were fortunes to find and lands to rule. This revision of the module should be run for 4 characters at 7th level. The party needs to be mercenaries for the Turanian army before these events can take place. 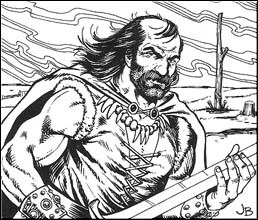 In the Hyborian world there are spell restrictions and there may not be clerics or druids in the party. 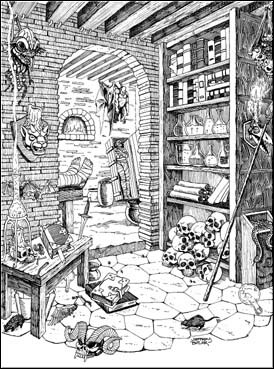 The PCs should not possess any magic items other than potions and scrolls. 7th level characters get only 1,900gp each to spend on initial equipment and supplies. Note that magic items cost 10x normal to a character without the feat or spells required to create the item. There is about 27,519 XP in this adventure which is about 6,879 XP each (about enough to reach 8th level). Detecting the dark cloud in time should be handled by a Spot check (DC 15, DC 17 in camp). When engulfed by the cloud, characters must make a Will save (DC 17) or be affected by a Fear spell. The shadows within the cloud are normal shadows with average statistics (see MM page 161). Due to the dark cloud, the shadows are more difficult to spot. Treat them as having a permanent Blur spell on them (20% concealment) but make them corporeal so that characters can wound them. Riders (32) are each Ftr2. Note: To remain standing after being roped requires a Strength check, DC 20. Success indicates the rider, and not the PC, is knocked down. Once securely tied, it takes a Strength check DC 23 to break the bonds. Note: When a character performs an act that could potentially free him and gain him support, that character must make a Charisma check, DC 10. If he fails, each further check gets a +2 circumstance modifier (cumulative). The character may not get more than 10 supporters without the Leadership feat. If the hetman is challenged without enough support, he will quit if the PC makes a Charisma check DC 20 (+2 circumstance bonus for the Leadership feat). Tarlas Constantius (Hetman), Male Human Ftr 6: +9/+3 melee, hp 57, init +1, AC 16, saves +9/+3/+4, Str 17, Dex 12, Con 18, Int 15, Wis 14, Cha 15, feats: expertise, dodge, mobility, spring attack, whirlwind attack, power attack, mounted combat, trample. Possessions: chainmail, longsword, dagger. Karaz Chaam (Lieutenant), Male Human Barbarian 7: +9/+4/+5 melee (two-handed), hp 74, init –1, AC 9, saves +9/+1/+1, Str 19, Dex 8, Con 18, Int 7, Wis 9, Cha 10, feats: cleave, improved bull rush, power attack, two-weapon fighting. Abilities: rage*2, uncanny dodge (Dex bonus to AC, can’t be flanked). Possessions: longsword, light mace. Rossim the Beardless, Male Human Ftr4/Rog2: +5 melee or +4 missile, hp 41, init +5, AC 15, saves +6/+5/+3, Str 14, Dex 12, Con 14, Int 18, Wis 15, Cha 14, feats: run, mounted combat, ride-by attack, spirited charge, improved initiative, expertise, improved disarm. Abilities: sneak attack +1d6, evasion. Possessions: scale mail, scimitar, shortspear. Turanian soldiers are each War2. Note: If any character becomes suspicious, allow a Spot check, DC 10, to notice something is not right with the horses. 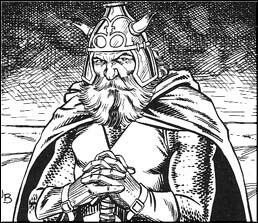 Talking the hetman into freeing one’s companions requires a Charisma check, DC 15. Durmas, Bbn5: +9 melee, hp 41, init +1, AC 11, saves +6/+2/+0, Str 19, Dex 13, Con 16, Int 8, Wis 8, Cha 8, feats: improved unarmed strike, combat reflexes, dodge. Abilities: rage*2, uncanny dodge (Dex bonus to AC, can’t be flanked). Note: The character may choose to use unarmed strikes or grappling in this combat. Durmas will grapple (see PHB page 137). To find out if the character is surprised when Durmas returns a second time, roll a Listen check DC 10. Stygian Illusionist, Ill4: +2 melee, hp 14, AC 10, saves +1/+1/+4, feats: scribe scroll, literacy, dodge, skill focus (intimidate), extend spell. Spells (4+1/4+1/2+1): prestidigitation, mending, ghost sound, dancing lights, daze; change self, color spray, expeditious retreat, hypnotism, silent image; invisibility, misdirection, whispering wind. Note: If the PCs do not join the raid, there should be no experience for this encounter. If the characters are prisoners, they encounter a Brown Bear with average stats (see MM page 193). Because the party is chained and without equipment, this is a higher EL than normal. If the characters are free, then they encounter a Gargoyle with average stats plus speaks Turanian (see MM page 94). To decide if the characters are caught flat-footed, have them roll a Spot check DC 20. The party is expected to defeat the gargoyle in this scenario (most likely without magic weapons) due to their greater power and freedom. Vardan, Rog5: +3 melee, hp 17, init +7, AC 13, saves +1/+7/+1, feats: improved initiative, dodge, quick draw. Abilities: evasion, uncanny dodge, sneak attack +3d6. Possessions: scimitar (dosed with greenblood oil, see DMG page 80). Note: To determine if the characters are surprised, have them roll a Listen check DC 20 (DC 25 if asleep). An Invisible Stalker with average stats (see MM page 123) takes Costhiras. It should not be defeated by the party, nor should it engage them longer than necessary to steal the woman. If the party does not prevent the stalker from taking Costhiras they should get no experience. Bor’aqh Sharaq, Ftr7: +13/+8 melee or ranged, hp 69, init +4, AC 14, saves +9/+6/+3, Str 17, Dex 18, Con 18, Int 14, Wis 13, Cha 13, feats: power attack, cleave, sunder, weapon focus (hand-blade), weapon specialization (hand-blade), toughness, expertise, improved trip. Possessions: horned helm, hand-blade (treat as masterwork longsword, can be fired as hand hurled weapon with range increment 10’, full round action to reload). Zorias the Kushite, Ftr4: +8 melee, hp 27, init +0, AC 12, saves +5/+1/+1, Str 16, Dex 11, Con 13, Int 10, Wis 10, Cha 13, feats: combat reflexes, leadership, toughness, weapon focus (longsword), weapon specialization (longsword), power attack. Possessions: leather armor, longsword. Red Brotherhood are each War2. Consider the solo rowing a forced march requiring a Fort save DC 14 (see PHB page 143). On the third day, the character must make a Profession (Sailor) DC 10 check to sense the boat about to rock. On the fourth day, the extra shift rowing forces the PC to fail his Fort save for that day’s forced march. The half rations starting on the fifth day imposes a –2 hunger penalty to all skill checks and saving throws until the rations return to normal. On the seventh day, a Spot check DC 20 can be made to see Bor’aqh about to throw the dagger. Slaves are Com1 wielding clubs. Mercenaries, passengers, and marines are War3. The Turanian Captain is a War10. A Scry check DC 20 will tell the characters they are being watched. Either Bor’aqh or the Red Brotherhood will attack sometime while on the beach. The Brotherhood is superstitious and heavy use of magic will cause them to hesitate or flee. The Guardians are Huge Animated Objects with average stats and hardness 8 (see MM page 17). 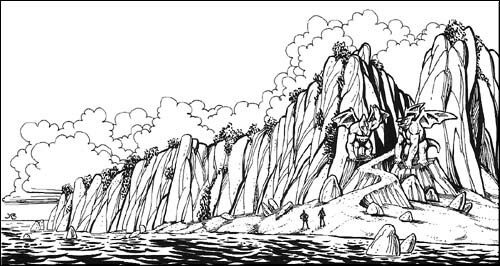 Pushing a boulder over the cliffs requires a Strength check DC 20 (but the strongest character can be assisted, see PHB page 62). Moving off the paths reduces speed to ½. Cliffs can be climbed, requiring a Climb skill check DC 15. Falling from a cliff results in a fall of 1d8*10 feet. Crossing rough ground causes 1d6 damage per hex crossed. At night the party is attacked by a Minotaur and 10 Stirges, each with maximum hit points (60 and 10, see MM pages 137 and 173, respectively). Encountered separately, the stirges are found in swarms of 6, but the EL for getting through to the citadel will always be the same. It is possible to climb the tower, but it is very difficult, requiring a Climb check DC 25). Encounters from here on seem to be below the level of the party but remember there is no chance to rest and the party has no healers and few supporting magic items. A Giant Constrictor Snake with maximum hit points (99, see MM page 201) sleeps here. An opposed Move Silently/Listen roll is needed (-2 on the snake's listen for being asleep). A semi-intelligent Dire Ape with maximum hit points (50, see MM page 193) guards the tower. Pit Trap (40 ft deep): CR 2; no attack roll necessary (4d6); Reflex save (DC 20) avoids; Search (DC 20); Disable Device (DC 20). The pit drops into room 1 and immediately awakens the snake there. This room has a canister of gray lotus powder. It should be treated like Insanity Mist (see DMG page 80). If the characters are captured, their equipment is placed here. There is a harmless trap on the door (Search DC 20; Disable Device DC 20) which if triggered causes a bell to ring, alerting the wizard. If Costhiras is here, her cell is locked with an average lock (Break DC 20; Pick Lock DC 25). Gas Trap: CR 4; no attack roll necessary; Reflex save (DC 21) avoids; Search (DC 21); Disable Device (DC 25); Rock crystal walls (Hardness 0; 144 hp). Note: Bhir-Vedi will leave the characters trapped until they appear to have succumbed to the purple lotus gas (treat as Insanity Mist, see DMG page 80). Each round they will be exposed to the gas. The only hope is that someone can break through the four foot walls or a character escaped under the falling wall. Otherwise they will be trapped for the conclusion of this adventure. Breaking a manacle requires a Strength check DC 24. The party’s equipment will have been removed to the laboratory before they regain consciousness. Note: If the ritual is interrupted and the tower collapses, the creature that emerges to kill Bhir-Vedi is a Frost Worm. It is not interested in the party.